Cairns Introductory Diving - No experience necessary! Introductory Diving is open to everyone who visits Cairns’ Great Barrier Reef. What is introductory diving? It is scuba diving for beginners. No previous scuba experience is necessary and it is a great way to try scuba diving, before committing to a learn to dive course. 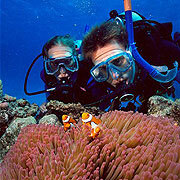 It allows you to scuba under the water, a great way to explore the Great Barrier Reef. Introductory diving is also known as Discover Scuba Diving, because it is exactly that. These dives let you experience the Great Barrier Reef from a totally different perspective, allowing you to get up close with the colourful marine life. All instruction and equipment is provided and a professional Instructor will be with you the whole time, from getting into the water, to diving around the reef and returning to the boat. Basically anyone aged 12 and over who passes the dive medical questionnaire can try an Introductory Dive. Please note there are some health ‘conditions’ which may prevent you from trying introductory scuba diving. The most common reasons include asthma, epilepsy, heart conditions and/or prescription medication (other than the contraceptive pill). These reasons are for your own health and safety in the water, so it’s important you are honest when completing the on-board, pre-introductory scuba diving medical questionnaire. NB: If you have any pre-existing medical conditions indicated on the questionnaire and/or are taking prescribed medications, then it is recommended you complete a dive medical prior to booking the tour and boarding the boat. This medical must be completed by a doctor familiar with dive practices and in compliance with Australian Standards AS4005.1. Also, pregnant ladies can not scuba dive for medical reasons. What happens on your Cairns Introductory Dive Trip? Introductory diving is completed in stages. Once you have decided you want to try this new experience out (and you won’t regret it!) qualified scuba Instructors provide safety and equipment briefings on the trip to the Great Barrier Reef. They also show you the basic hand signals that divers use to communicate with each other under the water. These are very important, as of course, you can’t talk when you are under the water. Safety and equipment briefings complete, instructors will give an overview of the general knowledge of scuba diving, including some practical demonstrations on the basic skills you’ll need to complete when in the water. On arrival at the Great Barrier Reef, you will be provided with a wetsuit / lycra suit and are shown how to put on your scuba gear. Your Instructor will be with you every step of the way. On entering the water, they will make sure you are comfortable and that your mask is fitted correctly. When you are ready, you will descend with the Instructor to one (1) metre under the water. Here you stop, so you can practice breathing through your regulator and get used to not coming up for air (an unusual experience / sensation for first timers). Once you are comfortable, you descend another few metres and stop again, to become familiar with your new surrounds. Once you have indicated to the dive instructor that you are ready, they will take you by the hand on your Introductory Scuba Dive around the Great Barrier Reef, where you can get close to the fish and may even see a turtle! You can take one or two (or more on liveaboard trips) introductory scuba dives on Cairns’ Great Barrier Reef. Once you have completed your basic in water skills on your first dive, you do not need to complete them on subsequent dives on that trip. However, if you travel another day, you will need to complete the whole process again. If you have done upwards of 50 Introductory Dives (and there are people who have) we recommend you consider completing your Open Water Certification. Introductory Dives are an optional extra to the Cairns snorkeling day tour price and usually last around 20-30 minutes, depending on air consumption. Cairns Dive Adventures is pleased to provide an Introductory Dive review, to give you a first hand account of what you can expect on an Introductory Dive. Am I nervous about completing an introductory dive? Do I want a smaller diver to instructor ratio? Do I need to pre-book my introductory dive? Do I want to try an introductory dive and also go on a glass bottom boat tour? Do I want to use the same diving equipment (rental) all day, or am I happy to share? Do I care about what type of boat it is (sailing boat or fast catamaran)? Do they even offer introductory diving? Can I pre-book my introductory dives? Are there any special packages available for introductory diving and do they need to be pre-booked? What’s better, an introductory scuba dive or a helmet dive? This is a tricky question, to which there is no right or wrong answer. Basically, it all depends on the individual. Some people will prefer the comfort of walking under the water on a pathway (helmet diving), while others will prefer the freedom of swimming around the reef with a certified scuba diving instructor. NB: You do get to see more of the reef on an introductory scuba dive, as you are moving around and can go looking for things. For non-divers, both are a great way to explore the reef under the water. Can I try Introductory Diving on a Cod Hole or Coral Sea Liveaboard Trip? Whilst you can snorkel on these trips, there is no availability to complete an Introductory Dive. There are not the crew or resources available to offer this option. So, if you want to try an Introductory Dive, then a Cairns Outer Reef Liveaboard Trip is the best option for you. Are there child minding / babysitting services on any Cairns Great Barrier Reef trips? If you are considering a Cairns Introductory Dive please keep in mind there are no child minding services on board any of the vessels out of Cairns or Port Douglas. If you are travelling with children, then you will need to have at least two adults in the group and one must be supervising the child at all times. You will be able to arrange separate dive times with the crew, enabling both adults to dive during your Great Barrier Reef trip. Can I try an Introductory Dive and be able to dive with my buddy who is a certified diver? Yes, as long as your certified scuba diving buddy is happy to dive to the restrictions enforced by Introductory Diving, which includes being guided by a dive Instructor, going no deeper than 12 metres and having a dive time limited to around 20 minutes. If they are happy to do this, then they will need to also book on as an Introductory Diver. If you would like to dive together by yourselves, you can arrange a Private Guide on some of the Cairns Outer Reef Day Trips. This is an additional cost and generally needs to be arranged a week in advance. Ask us for more information info@cairnsdiveadventures.com. What age do I need to be to do a Cairns Introductory Dive? To complete an Introductory Dive, you need to be at least 12 years old. If you have a 12+ year old child that wishes to complete an Introductory Dive on one of the Cairns Diving Tours then please take into account that the smallest size BCD (buoyancy control device) on any boat will be a woman’s extra small. If this is too large for your child, then they will not be able to dive. For their safety, it is important all diving equipment fits correctly. What happens if I don’t complete my pre-booked Cairns Introductory Dive? If for some reason you do not complete your pre-booked Introductory Dive/s then you may be eligible for a refund, depending on the company policy of the Cairns Dive Trip boat you are on. Please see notes on this below and ask us for more information. In some instances, such as if you have booked a ‘special’, then no refunds are available. Some companies will offer a refund should you not be able to dive due to a medical reason. Some companies will charge once you have descended under the water. Is it worth doing a Cairns Learn To Dive course, if I only want to do one Introductory Dive? No. Introductory Diving is a great way to explore the Great Barrier Reef. It’s also a great way to see if you enjoy scuba diving (and the sensation of breathing under water), which not all people do. If you like it and you fall in love with scuba diving (as we did! ), then you can book a Cairns Learn To Dive Course. If I complete an Introductory Dive, does it count towards my Cairns Learn To Dive Course? If you complete an Introductory Dive with a Cairns company that also run Cairns Learn to Dive Courses, then it may be possible to have your introductory dive count towards your certification. Please note: This will not provide any cost reduction / benefit on a learn to dive course, but it may allow you to complete an additional dive as a certified diver. Not available with all operators: contact us for more information. Does completing a Cairns Introductory Dive make me a certified diver? No. An introductory dive gives you some general knowledge as well as basic scuba skills, enabling you to complete an underwater dive, accompanied and supervised by an experienced Instructor. It does not give you all the information and skills that allow you to be a Certified Diver, who is able to scuba dive unaccompanied. To become a certified scuba diver you need to complete an intensive theory component and several training dives: Learning to Dive Courses in Cairns take a minimum of four (4) days to complete.